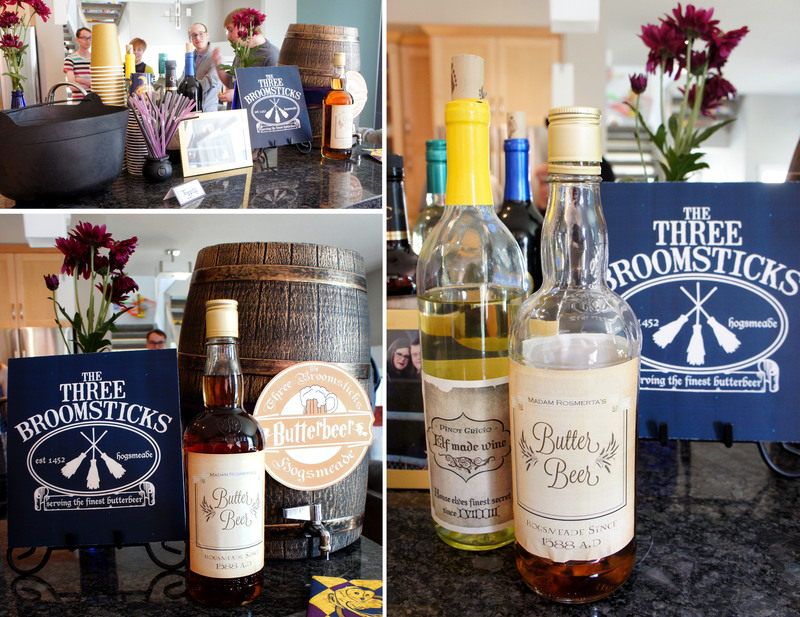 I love the idea of a couple’s wedding shower! I’ll admit that I was a bit confused and unsure when my brother first suggested that is what he and his wife-to-be would like, but now that it is done and over with I think it is a wonderful idea. The couple gets to celebrate their upcoming marriage together with family and friends – because isn’t being together really what an engagement is all about? They will each have their separate stag and stagette parties, but I love that this gave them the opportunity to celebrate with their collective friends. The Harry Potter theme was something the bride-to-be requested and, even though I have never read a Harry Potter book, I was happy to oblige. I love me a good themed party and my lack of Harry Potter knowledge just gave me a little extra challenge in creating the perfect party. 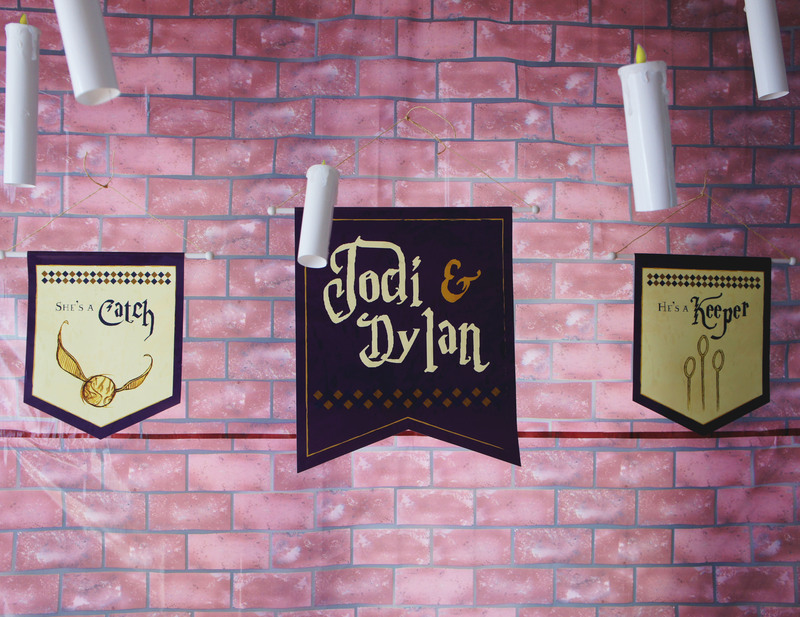 There is no shortage of Potter party ideas on pinterest so it proved fairly easy to pull things together and the hardest part became figuring out when to stop! I, of course, began with the invites. You can see the full details on the invites here. 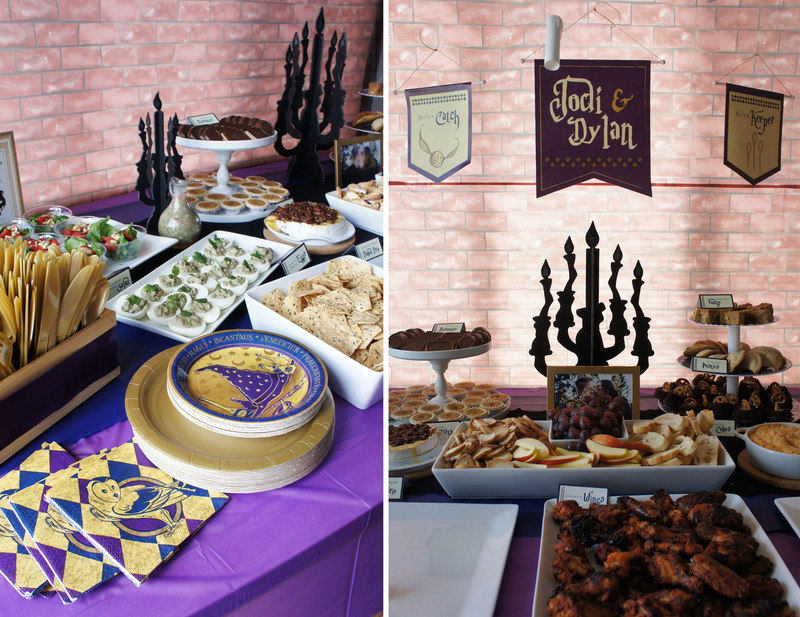 I loved the way the invites turned out, so I decided to carry the imagery across to my party décor and designed these large banners to hang behind the food table. 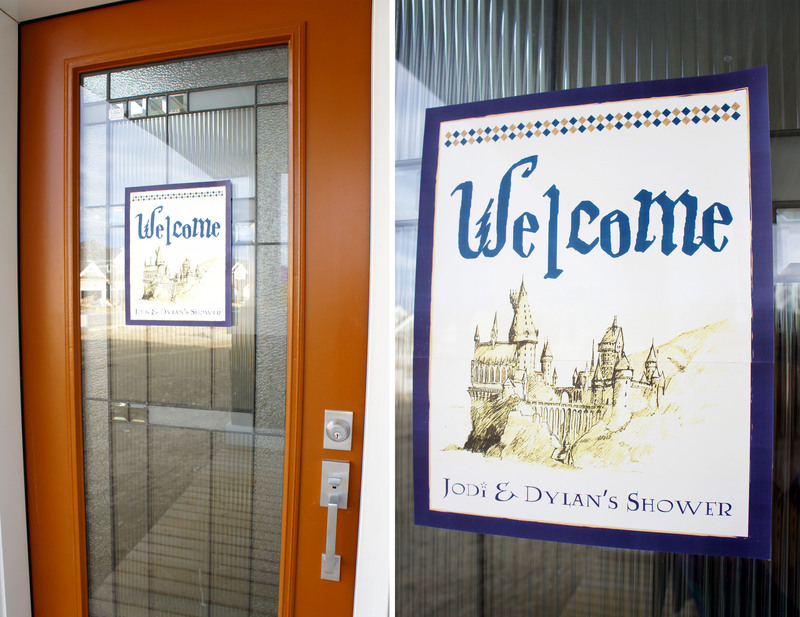 I used the same graphic style for a sign which greeted guests at the front door. I always dislike not knowing if I am in the location for a party so I like to have some sort of wreath or sign on my front door indicating to people that they are in the right place. 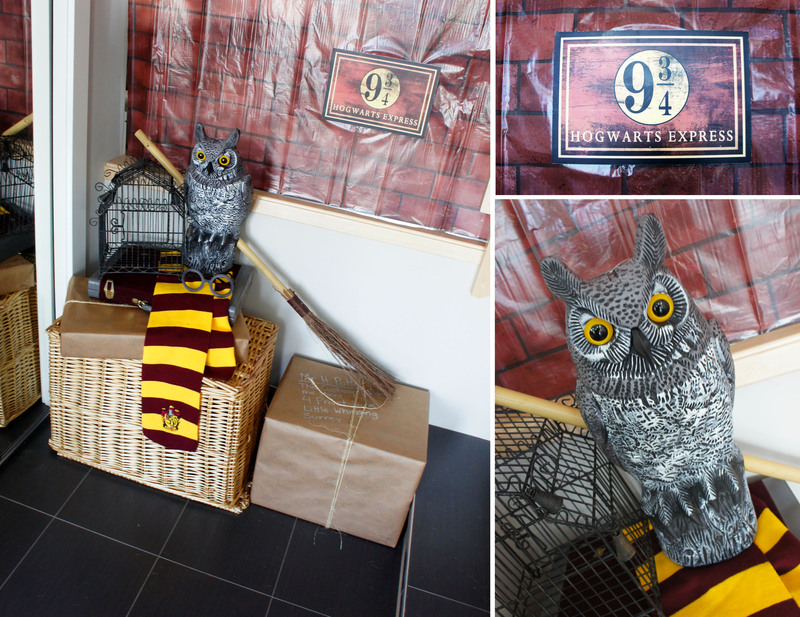 Inside, I transformed my front foyer into Platform 9 3/4 with the help of some wrapped cardboard boxes, a dollar store owl, a Harry Potter Scarf and glasses, a broom and a lovely birdcage borrowed from my sister. The drink of choice was Butterbeer and it was served out of a barrel my sister crafted from some plastic dollar store plant pots and ribbon. The actual butterbeer was made following this great recipe from Just Sweet & Simple that included a delightful whipped topping. 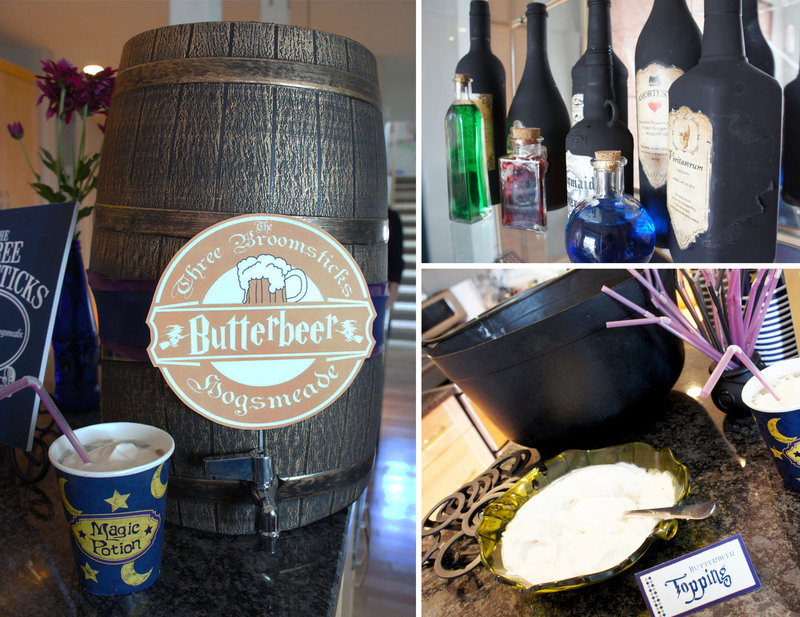 There were also alcoholic choices at our Three Broomsticks stand including a couple varieties of Elf Made Wine, Ogden’s Old Firewhiskey, and a bottle of Butterscotch Schnapps, which made a delicious addition to the Butterbeer. 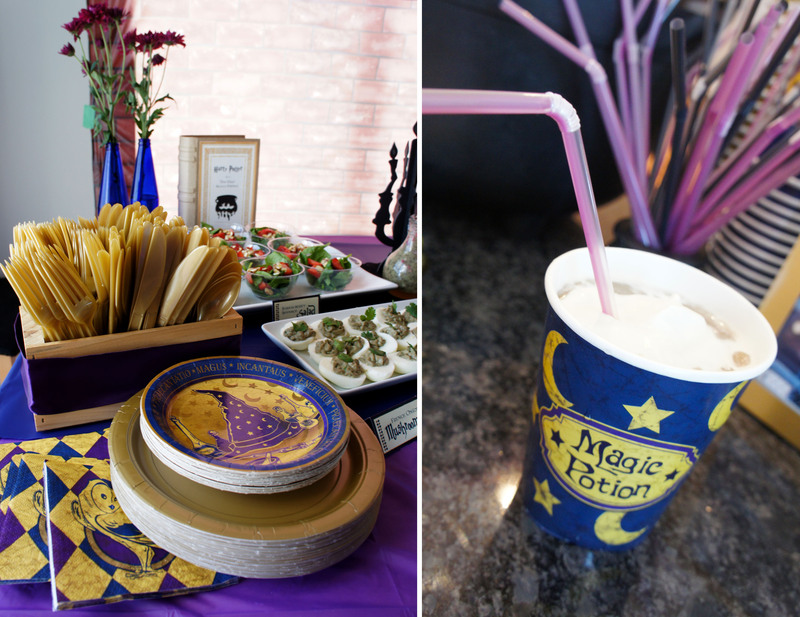 Drinks were served out of adorable “Magic Potion” paper cups I found on Oriental Trading. They have a whole line of Wizard Realm products so I ended up ordering the cups along with napkins, paper dessert plates, spellbook treat boxes, mini cauldrons and plastic Harry Potter glasses. They were well suited to the party and I carried their color scheme throughout my labels and pintable’s. It just so happens that the wedding colors are also blue and purple so I don’t think it could have worked out more perfectly! The main food table was layered with purple and blue plastic table cloths and then decorated with candelabras, cardboard books, and fresh cut flowers displayed in upcycled blue glass beer bottles. The brick background was also bought off Oriental Trading and DIY floating candles created from battery operated tealights and paper were hung on fishing line above the table to add the finishing touch to my “great hall”. 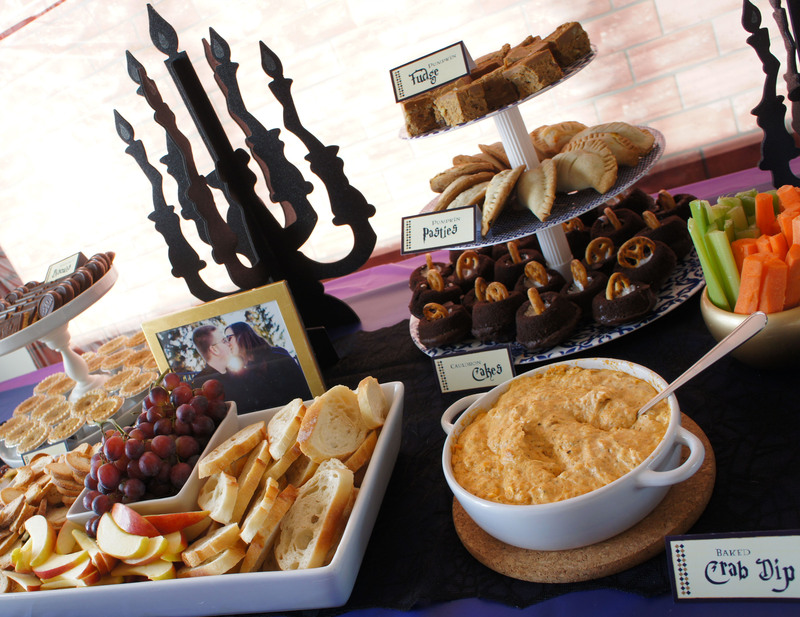 I served a variety of British inspired finger foods, worthy of the finest feast in the Great Hall at Hogwart’s. 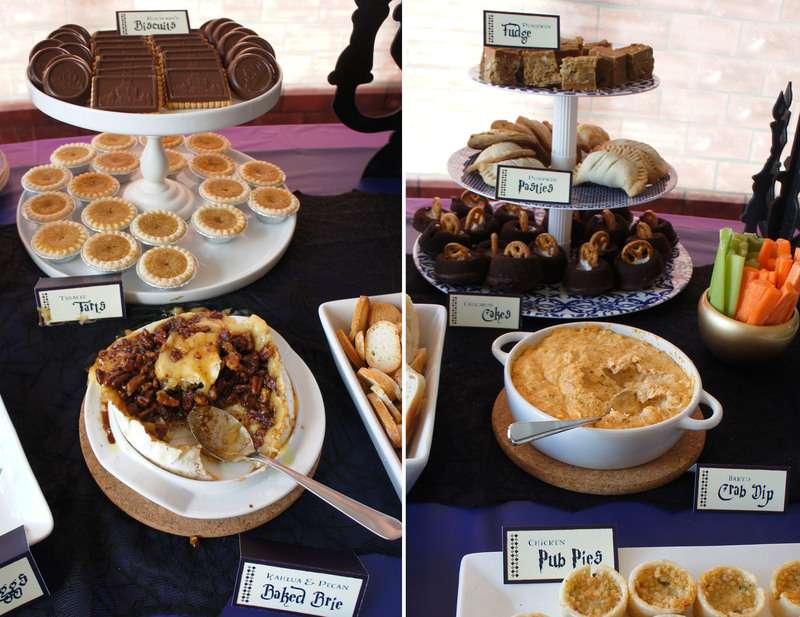 The food included individual chicken pub pies, mini beef wellington, barbequed chicken wings, spinach salad, guacamole devilled eggs, Kahlua and pecan baked brie, warm crab dip and a mashed potato bar. We also couldn’t forget all the great Harry Potter sweets, so platters were filled with treacle tarts, pumpkin fudge, cauldron cakes, pumpkin pasties and Hogwart’s biscuits. And just in case that wasn’t enough sweets, we had our very own Honeyduke’s stand right off the main food table. 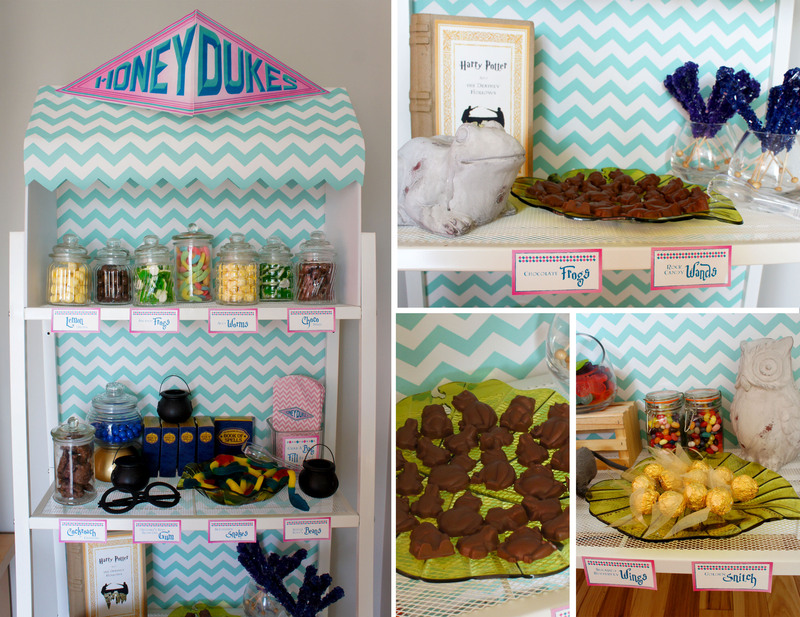 I love creating candy displays so I was very excited to learn about Honeyduke’s in my research and come up with all the different candy I could incorporate into a display. 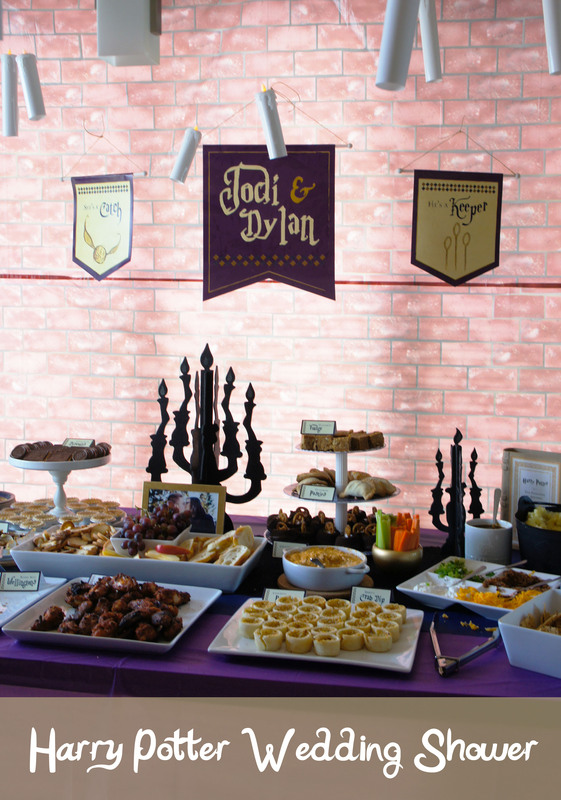 Party guests were invited to fill their small Honeydukes branded paper bags with everything from Bertie Bott’s Beans, Drooble’s best blowing gum and chocolate frogs to long gummy Slytherin snakes, rock candy wands and golden snitches. 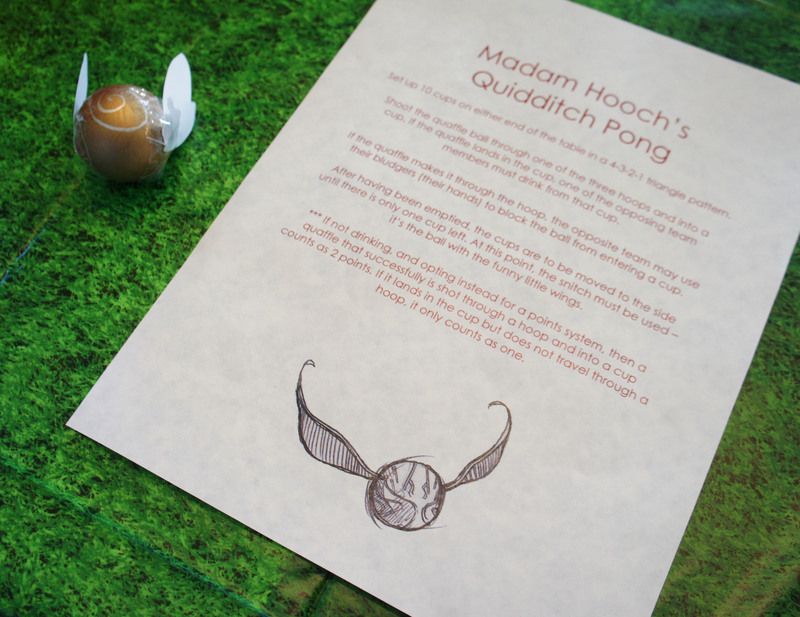 Speaking of snitches, the one shower game we did have was Quidditch Pong. The Maid of Honor did a wonderful job creating the hoops and balls that we displayed on a folding table covered in an artificial turf tablecloth. Their wasn’t much drinking happening at the shower, but I do know the kids sure had a fun time trying to get the balls in the cups! It turned out to be an amazing, laid back day celebrating my brother and my soon to be sister-in-law. I got to meet their lovely friends, we all got to eat some great food and I was excited that all my close family members were able to come share in the happy occasion. I will be sharing more detailed photos of the Honeydukes candy display and a food post with recipes in the upcoming days so please be sure to check back! 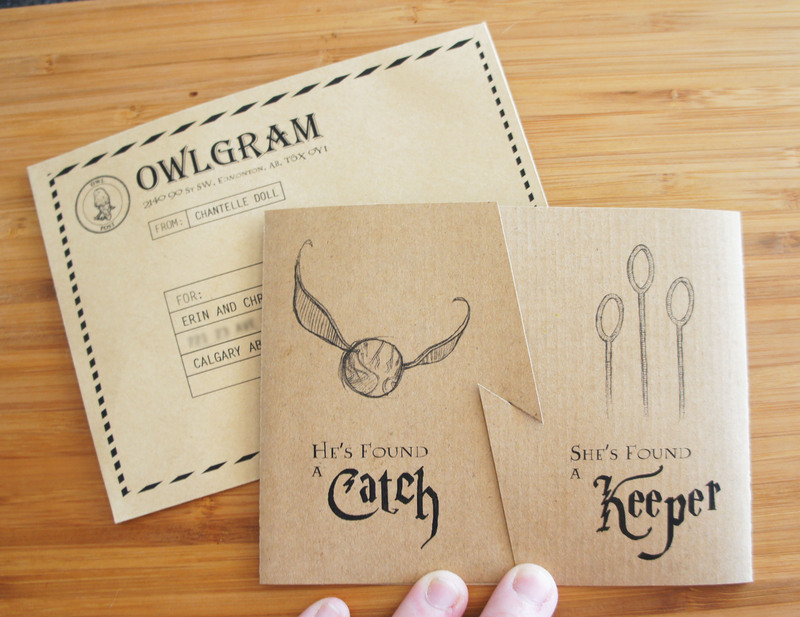 And if you’re still looking for more Harry Potter party ideas? Visit my pinterest board to see some other great parties and inspiration. This party looks amazing! I love all the details! Wowzer, you knocked my socks off. I loved the way it turned out for a Muggle (non-Potter Head) and all. This is such a cute shower!!! Is there anyway you could upload the banners you made? Or explain how you made them? Thank you!!! I will work on getting the banner artwork uploaded. Thanks for the kind comments. 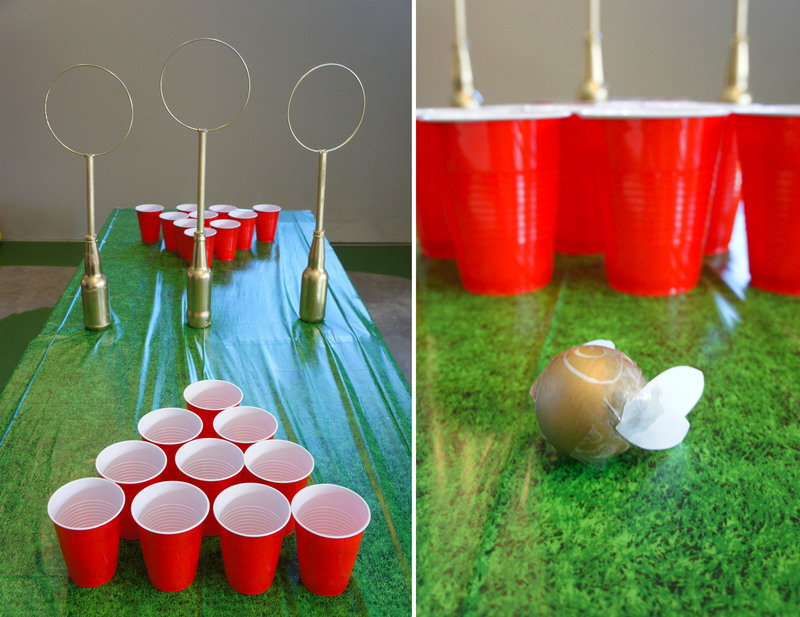 I love the Quidditch pong idea!! It’s brilliant!! What did you make the Quaffle out of? You showed a picture of the snitch, but I didn’t see one of the Quaffles. I don’t believe we had an official Quaffle. We used the snitch and other plain white ping pong balls. Oh ok. That is simple enough. Thank you for responding so quickly.